Once upon a time, I was a woman who worked outside of my home. I had a job as an administrative assistant at a busy car dealership and loved my job. When I became pregnant with my first baby, I quit my job so I could be a stay at home mom to my daughter and I have never regretted that decision. When I was working, I remember loving getting dressed up for work, doing my hair and makeup and putting on my fancy shoes. Now, I get out of bed in the morning, shower, throw my hair up in some clips and hit the ground running. Boy do I miss those days sometimes. :) My busy life with four small children limits my ability to pamper myself and make myself look gorgeous every day but you know...it doesn't mean that I can't TRY to look good once in awhile. Wearing makeup and doing my hair is something that I enjoy and being able to use natural products in my beauty routine is something that I enjoy even more! This makeup was created for people who want to give their complexion the perfect finish without compromising the health of their skin. We are so excited to introduce this new way to wear makeup! Our Multi-Purpose Foundation is a non-toxic way to tint your existing skin care routine. Our natural minerals allow you ​create a liquid foundation with the coverage you need — from a tinted glow to a flawless finish. You choose your Facial Oil or Serum and Multi-Purpose Foundation color that’s best suited for your skin. Our mineral powders ​have been created to give you the coverage you want. For a deep foundation, use a little more powder with your oil or serum, and for a lighter finish, simply use less powder. Our mineral powders easily blend together, so that you can customize your own unique color blend, adjust with the seasons, or create unique looks. 100% pure mineral powders contain no additives and provide natural UV protection. Annmarie's facial oils are exquisite...the scents are vibrant and earthy and they are so moisturizing. I have tried them in the past and was very impressed, they worked really well with my skin's chemistry. The Earth Minerals Foundation sounded wonderful and I was excited to check it out. So, for this review I was sent a sample kit of the Earth Minerals Multi-Purpose Foundation. It doesn't look like much but really, a little goes a long way. So, here is how you use this mineral makeup. First, tap a small amount of powder out into your hand. Then, add one or two pumps of oil. In this case, I added a few drops from the small bottle that came in my kit. Last of all, finger-mix the oil and the powder together and voila! You now have some amazing foundation to apply. I did use this foundation and found that because I am a fair skin tone, the pearl and the sand were the best choice for me. I don't like to look too white but I don't want to look like I have a different colored face from my neck. I don't want to look "painted". This foundation mixed so well and applied so smoothly, it is definitely something that I will be using again. 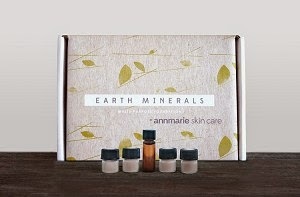 If you would like to check out these newest Earth Minerals from Annmarie Skin Care, be sure to visit their website and also, visit Annmarie on Facebook. Their beauty products are second to none and I personally love and use them. If you purchase this sample kit for $20, you are sent a $10 off coupon with your package so you can order something else that you love! You can also order full sized bottles of the Mineral Makeup as well. Be sure to visit Annmarie Skin Care today and revamp your beauty routine...naturally! Disclaimer: I received no monetary compensation for this post.I did receive free Annmarie Makeup samples for review purposes. All quotes and stock photos are from the Annmarie Skin Care website and email. All thoughts and opinions are 100% mine.